The interaction between CD28 on T cells and CD80 on APCs intensifies the linkage between TCR and MHC at the site of contact between T cells and APCs. In this study, we demonstrate that during human T cell/human APC interaction, the autologous or allogeneic human CD4+ T cells become positive for the detection of CD80 at an early stage of activation (24 h). This detection of CD80 is attributable to the acquisition of CD80 from APCs, as opposed to the up-regulation of endogenous CD80, as demonstrated by CD4+ T cells treated with cyclohexamide. Furthermore, no CD80 mRNA could be detected at 24 h in T cells that had acquired CD80 from APCs. CD80 acquisition by T cells from APCs was enhanced upon TCR engagement. The amount of CD80 acquisition by CD4+ T cells was shown to be related to the expression of CD80 on APCs. Using soluble fusion proteins (soluble CTLA-4, CD28, and CD80) to block either CD28 on the surface of T cells or CD80 on the surface of APCs, it was demonstrated that CD80 acquisition by T cells is mediated through its receptors, possibly CD28 interaction. Moreover, we demonstrate that T cells that have acquired CD80 have the ability to stimulate other T cells. These data thus suggest that CD80 acquisition by human T cells might play a role in the immunoregulation of T cell responses. The interaction of T cells with specific peptides bound to MHC molecules on APCs causes naive T cells to proliferate and differentiate into effector cells (1, 2). Stimulation of T cells by APCs involves at least two signaling events: signal 1 induced via TCR recognition of peptide-MHC complexes and signal 2 elicited by CD28 molecules on T cells interacting with CD80 or CD86 on APCs. In addition to CD28-CD80 interactions, interactions between several other molecules on T cells and their complementary molecules on APCs appear to augment T cell stimulation (3, 4, 5, 6). The interaction between T cells and APCs leads to tight conjugate formation and rapid segregation of supramolecular activation clusters at the T cell contact site (7, 8, 9). The formation of tight conjugates between T cells and APCs raises the question of how these cells subsequently disengage themselves, and whether the cells retain or exchange their respective cell surface molecules. Recently, studies in mouse systems demonstrated that T cell-APC interaction can cause APC-derived surface molecules to adhere to the surface of T cells and to be internalized through TCR endocytosis (10, 11). Moreover, data from our laboratory and others in mouse models demonstrated that CD80 molecules are physically acquired by naive as well as memory T cells from APCs shortly after T cell activation; this acquisition plays a role in the activation of bystander T cells (12). In the early 1970s, Hudson et al. (13, 14) also demonstrated that alloreactive murine T blast cells generated during a graft-vs-host reaction in vivo expressed Ig molecules. In addition, the same investigators showed that the Ig molecules were of donor origin. Later, other studies with murine bone marrow chimeras indicated that donor-derived thymocytes were able to acquire host MHC molecules (15, 16). Although the acquisition of costimulatory molecules by T cells in mice has now been established, no studies have addressed this phenomenon in humans. On the contrary, reports exist that upon stimulation, human T cells express CD80. Early studies on the activation of T cells demonstrated that CD80 appears relatively late after T cell activation and can be detected on long-term activated human T cells isolated from PBMC, CD4+ T cell clones, and CD8 T cell clones (17). Moreover, studies performed on T cells from rheumatoid arthritis patients showed that 30% of synovial T cells express CD80 molecules on their surface, in contrast to synovial T cells from normal donors (18). In studies of patients with systemic lupus erythematosus, there was an increase in the amount of CD80 on PBLs, including T cells (19). The perception has thus been that the expression of CD80 on human T cells is attributable to de novo up-regulation of CD80 as the result of T cell activation. However, it should be pointed out that all of the studies mentioned above analyzed T cells at long intervals following activation; none of these reports analyzed the early events in human T cell activation. In this study, we demonstrate for the first time that CD80 detection on T cells shortly after activation is a consequence of acquisition from APCs, and not from endogenous up-regulation of these molecules by human T cells; we also demonstrate that this phenomenon is perhaps mediated by the interaction of CD80 with CD28 receptors, and is enhanced if the APCs have increased CD80 expression. Furthermore, we demonstrate that purified CD4+ T cells that have acquired CD80 actually have the ability to enhance the proliferation of other human T cells and can thus, in essence, themselves act as APCs. Peripheral blood was collected by apheresis from normal healthy donors. PBMC were isolated by standard Ficoll-Hypaque (ICN Biomedicals, Aurora, OH) density centrifugation. Cells were washed three times with 1× PBS, and were then resuspended at 20 × 106 cells/ml in a beads separation medium (1× PBS, 0.5% BSA, supplemented with 2 mM EDTA) (BioSource International, Camarillo, CA). CD4+ T cells were then selected by column purification using CD4+ beads according to the manufacturer’s instructions (Miltenyi Biotec, Auburn, CA). CD4+ T cells were resuspended at 1 × 106 cells/ml in complete medium (RPMI 1640 medium; Life Technologies, Gaithersburg, MD) containing 10% FCS, 2 mM glutamine, 1 mM sodium pyruvate, and 100 U/ml penicillin-streptomycin, nonessential amino acids) for cell culture or they were resuspended in FACS buffer (PBS (Life Technologies) with 0.2% BSA (Sigma-Aldrich, St. Louis, MO)) for the FACS analysis. CD14+ peripheral blood-derived monocytes were isolated from leukopaks from healthy donors by counterflow centrifugal elutriation. Fresh monocytes were cultured in six-well tissue culture plates at 2–3 × 106/ml (Costar, Cambridge, MA) in complete medium. At days 1, 3, and 5, recombinant human (rh)IL-4 and rhGM-CSF (PeproTech, Rocky Hill, NJ) were added to the culture at 50 ng/ml. DCs harvested at day 10 were repeatedly shown to be CD1a+, HLA-DR+, CD86+, CD40+, CD3−, CD14−/low, CD19−, and CD56− by flow cytometry (FACSCalibur; BD Biosciences, Mountain View, CA). The B cell line C1R-A2 containing stable HLA-A2 construct was obtained from Dr. A. Tsang (Laboratory of Tumor Immunology and Biology, National Cancer Institute, National Institutes of Health, Bethesda, MD). Cells were grown in a complete medium, and were maintained at 37°C under a 5% CO2 humidified atmosphere. C1R-A2 cells were maintained under the pressure of 1 mg/ml selective agent G418 (Life Technologies). CD4+ selected cells were stained with different Abs for 30 min on ice. The following Abs were used: CD4-FITC, CD45RA-FITC, CD45RO-FITC CD28-PE, CD80-PE, CD19−, and CD1a− PerCP (BD PharMingen, San Diego, CA). The three-color staining was analyzed on a FACSCaliber (BD Biosciences) using CellQuest software. RNA was isolated from CD4+ T cells and the B cell line C1R-A2, using a RNA STAT-60 kit (Tel-Test, Friendswood, TX). Five micrograms of total RNA were used in the cDNA synthesis reaction using the SuperScript Preamplification System (Life Technologies), according to the manufacturer’s instruction. CD4+ T cells that acquired CD80 in contact with APCs before the PCR were treated with 0.5% EDTA for 5 min. The cells were then isolated using CD4+ beads and column separation. The purity of these cells was verified by three-color FACS analysis. Oligonucleotides specific for CD80 and β-actin were synthesized by Biosynthesis (Lewisville, TX). CD80 amplification was performed by using 5′ primer GAC CCT AAG CAT CTG AAG CCA TG and 3′ primer TGA TCC CCA CGA TCC ATG TAT C. Primers used for β-actin amplification (1-kb fragment) were: 5′-GCT CAC CAT GGA TGA TGA TAT CGC and 3′-GGA GGA GCA ATG ATC TTG ATC TTC. Platinum PCR Supermix (Invitrogen, Carlsbad, CA) was used for amplification reaction. Cycling conditions consisted of 94°C for 2 min and then 30 cycles of 94°C for 30 s, 55°C for 30 s, and 72°C for 30 s, followed by a finishing step at 72°C for 7 min. PCR products were analyzed on 1.5% agarose gels in 1× Tris EDTA acetate buffer, stained with ethidium bromide. The cDNA fragments were visualized by UV light. Human CD152 (CTLA-4) Ig fusion protein. C1R-A2 cells (1 × 106) were incubated with 30 μg/ml CTLA-4 Ig fusion protein (Ancell, Bayport, MN) or purified IgG2a (BiosPacific, Emeryville, CA) for 30 min on ice. The cells were washed three times with 1× PBS and cocultured in a 1:1 ratio with CD4+ T cells for 24 h.
Human CD28 Ig fusion protein. C1R-A2 cells (1 × 106) were incubated with 30 μg/ml soluble CD28 Ig fusion protein (Ancell) or its isotype control, purified IgG2a (BiosPacific), for 30 min on ice. The cells were then cocultured with the selected CD4+ T cells, as described above. Human CD80 Ig fusion protein. CD4+ T cells (1 × 106) selected from PBMC, as described below, were incubated with 30 μg/ml CD80 Ig fusion protein (Ancell) or its isotype control, purified IgG2a (BiosPacific), for 30 min on ice. Cells were then cocultured with an untreated B cell line, C1R-A2, in a ratio of 1:1 for a 24-h incubation. Purified CD4+ T cells (5 × 106) were cocultured with 5 × 106 CIR-A2 in the presence of 1 μg/ml anti-CD3. Twenty-four hours postculture, CD4+ T cells that had acquired CD80 in the presence of APCs were treated with 0.5% EDTA for 5 min and were isolated by column separation and the purity of the cells was checked by three-color FACS analysis. Purified CD4+/CD80+ T cells (1.5 × 105) were added with or without 1 μg/ml anti-CD3, and cultured in 96-well plates (Costar) in a complete medium or a complete medium supplemented with 10% dextran for 48 h. Twenty-four hours before harvesting, cells were pulsed with 1 μCi [3H]thymidine to assess proliferative response. To evaluate the innate expression of CD80 on CD4+ T cells upon short activation, CD4+ T cells were purified from the PBMC of normal healthy donors (purity >97–99%) and analyzed by two-color FACS analysis. CD80 expression on CD4+ T cells was shown to be a relatively rare event (Fig. 1⇓Aa), as was similarly reported for murine T cells. Specifically, 15 donors were analyzed and the level of CD80 detection on 12 was between 1 and 3%, with the T cells of the remaining three donors displaying between 3 and 7%. A, Innate CD80 expression by activated and normal CD4+ T cells. Two-color FACS analysis was performed on T cells for CD4+ and CD80. 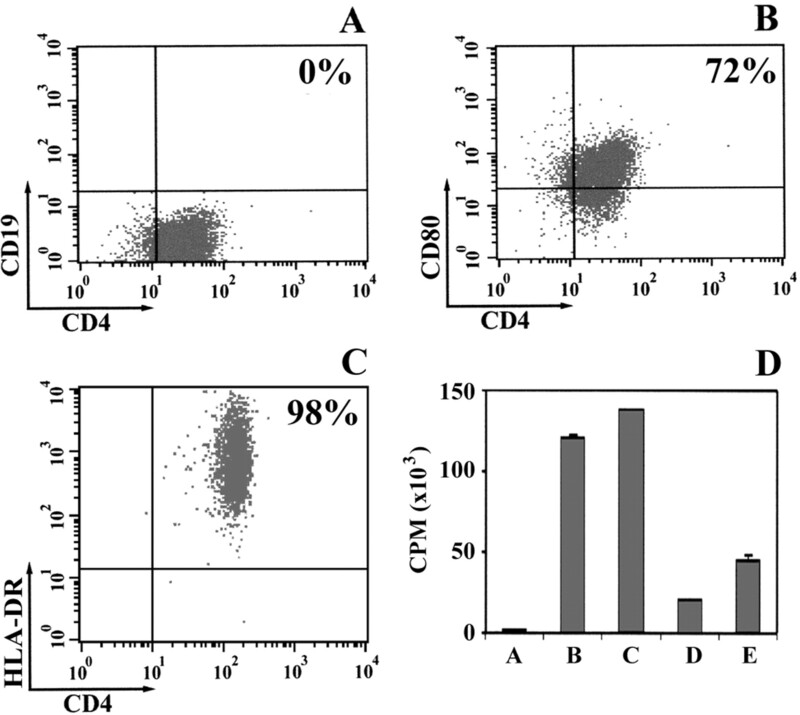 a, Expression of CD80 on human CD4+ T cells (gray line); b, CD80 expression on CD4+ T cells upon stimulation with 10 μg/ml anti-CD3 Ab for 24 h (gray line); c, CD80 expression on CD4+ T cells activated with 10 μg/ml anti-CD3 and anti-CD28 Ab for 24 h (gray line); d, CD80 expression by CD4+ T cells upon activation with 10 μg/ml anti-CD3 and anti-CD28 for 72 h (gray line). All gates are based on isotype control (black histogram). B, FACS analysis of CD80 expression on APCs. e, CD80 expression on human DCs (gray line).f, CD80 expression on the B cell line C1R-A2 (gray line). Gates were set based on isotype control (black histogram). We then addressed the question of whether a short-term stimulation of CD4+ in the absence of APCs can lead to an increase of CD80 expression. Purified CD4+ T cells were added to plates coated with either human anti-CD3 (10 μg/ml) or anti-CD3 (10 μg/ml) plus human anti-CD28 (10 μg/ml) for maximal stimulation. After 24 h, CD4+ T cells were analyzed for CD80 expression by two-color FACS analysis. CD4+ T cells alone that were stimulated with anti-CD3 expressed 3–4% CD80 on their surface (Fig. 1⇑Ab). Activation of these cells for 24 h in the presence of anti-CD3 and anti-CD28, respectively, did not lead to a higher expression of CD80 (3–4%) (Fig. 1⇑Ac). However, when CD4+ T cells were stimulated for 3 days with anti-CD3 and anti-CD28 without any APCs, 30% of the purified CD4+ T cells expressed CD80 on their surface (Fig. 1⇑Ad). These results demonstrated that the innate level of CD80 expression on the CD4+ T cells is extremely low. In addition, short-term activation (24 h) of T cells did not lead to de novo expression of CD80 on CD4+ T cells; however, long-term activation of T cells (72 h) with high anti-CD3 (signal 1) and CD 28 (signal 2) can lead to up-regulation of CD80 in CD4+ T cells. All additional experiments were conducted with human T cells after stimulation for 24 h or less. To investigate whether CD80 can be detected on CD4+ T cells upon activation with APCs, elutriated monocytes from healthy donors were cultured for 10 days in the presence of rhGM-CSF and rhIL-4 (50 ng/ml) to generate DCs that were used as APCs in these experiments. The phenotypes of the DCs were checked for the cell surface markers; they were shown to be CD1a+, HLA-DR+, CD86+, CD80+, CD3−, CD14−/low, CD19−, and CD56−. The purified CD4+ T cells (from healthy donors) were cultured for 24 h with DCs expressing CD80 (Fig. 1⇑Be). When DCs were incubated with CD4+ T cells isolated from the same individual (autologous CD4+ T cells), CD80 was detected on 6–37% of purified T cells in the absence of anti-CD3 (Fig. 2⇓A, each hatched bar is the representative of the percent of CD4 cells expressing CD80 from one donor). However, when CD4+ T cells were cultured in the presence of 1 μg/ml anti-CD3, CD80 was detected on 10–44.5% of CD4+ T cells (Fig. 2⇓A, black bars). Fig. 2⇓A shows the results derived from autologous DCs and T cells obtained from four different donors. Detection of CD80 on the surface of purified human CD4+ T cells after stimulation with autologous or allogeneic APCs. A, Detection of CD80 on CD4+ T cells from four different donors cultured with autologous DCs in the absence (▨) or presence (▪) of 1 μg/ml anti-CD3 for 24 h. B, Detection of CD80 on CD4+ T cells from five different donors cultured with allogeneic DCs in the absence (▨) or presence (▪) of 1 μg/ml anti-CD3 for 24 h. C and D, The phenotype of the cells in A and B was analyzed by three-color FACS to determine the expression of CD4, CD80, and CD1a. The level of contamination by DCs was <2%. E, Detection of CD80 on CD4+ T cells from four different donors cultured with C1R-A2 in the absence (▨) or presence (▪) of 1 μg/ml anti-CD3 for 24 h. The phenotype of the cells was analyzed by three-color FACS to determine the expression of CD4, CD80, and CD19. The level of contamination by C1R-A2 was <1%. We also performed five different experiments in which the CD4+ T cells were provided from donors different from those who provided the DCs. In this case, in the absence of anti-CD3 (signal 1), CD80 detection varied from 8–31.6% (Fig. 2⇑B, each hatched bar is representative of CD4 cells from an individual donor). In contrast, in the presence of anti-CD3 (as signal 1), CD80 detection increased from 13.5 to 53% (Fig. 2⇑B, black bars). These results demonstrated that upon activation of T cells with autologous or allogeneic DCs, CD80 can be detected on more CD4+ T cells upon TCR engagement. To exclude the possibility that CD80 expression on T cells is the result of doublet formation between DCs and T cells, samples were simultaneously stained not only for CD4 and CD80, but also for CD1a. As depicted in Fig. 2⇑, C and D, CD4 cells that express CD80 upon interaction with DCs did not express CD1a. To address the question of whether the level of CD80 detection on T cells is related to the level of CD80 expression on APCs, we used a B cell line (C1R-A2) stably transfected by the HLA-A2 gene. All C1R-A2 cells expressed a higher level of CD80 on their surface (Fig. 1⇑Bf) as compared with human DCs. CD4+ T cells were incubated with C1R-A2 in the presence or absence of anti-CD3 (1 μg/ml) for 24 h. Our results demonstrated that in the absence of anti-CD3, CD80 was detected on 33–71% of CD4+ T cells from different donors (Fig. 2⇑E, hatched bars). CD80 was detected on a higher number of CD4+ T cells (33–85%) in the presence of anti-CD3 (Fig. 2⇑E, black bars). All of the above experiments (Fig. 2⇑) were conducted with three-color FACS analysis for CD4+, CD80, and either CD1a for DC detection or CD19 for C1R2A detection. All CD4+/CD80+ T cells were <2% positive for either CD19 or CD1a (an example of this is also shown in Fig. 6⇓A). These results show that the level of CD80 expression on APCs is related to the level of detection of CD80 on CD4+ T cells. Moreover, TCR engagement (in autologous and allogeneic conditions) can enhance the amount of CD80 detected on CD4+ T cells. Studies were then conducted to determine whether the detection of CD80 on human T cells shortly after activation with both APCs and anti-CD3 is the result of de novo expression of CD80 by the T cell or the acquisition of CD80 by the T cell from the APC. Thus, human T cells were incubated with CHX (20 μg/ml for 12 h), an inhibitor of protein synthesis, before incubation with APCs and anti-CD3. Using three-color FACS analysis, T cells were analyzed for levels of CD80 as well as the early activation marker CD69. As seen in Fig. 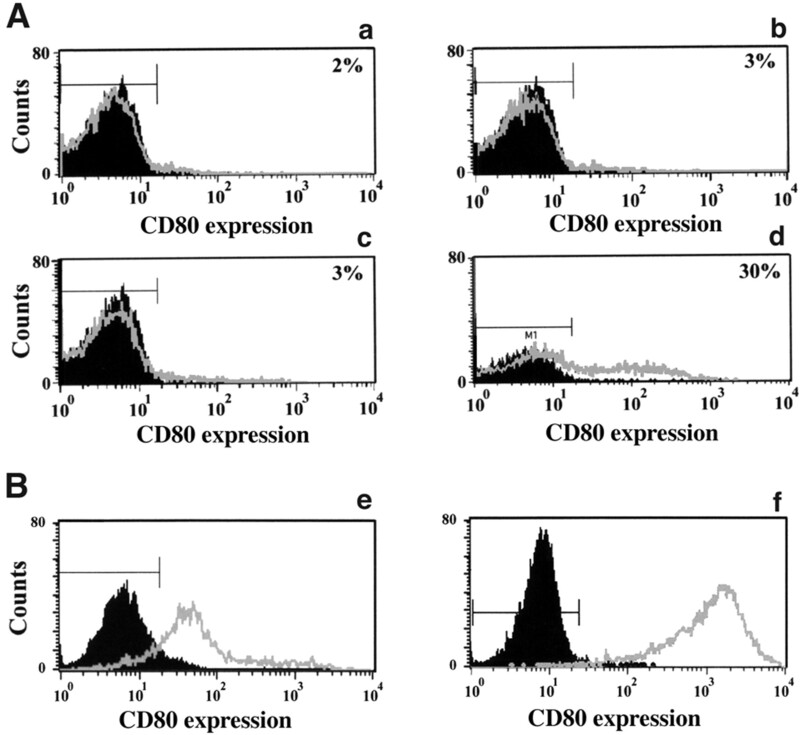 3⇓A, untreated CD4+ T cells incubated with anti-CD3 express high levels of CD69. In contrast, CHX-treated CD4+ T cells express at least 1 log less CD69 after incubation with anti-CD3. When the same cells as seen in Fig. 3⇓A were analyzed for CD80, both untreated and CHX-treated CD4+ T cells were shown to contain similarly low levels of CD80 after exposure to anti-CD3 (Fig. 3⇓B). Effect of CHX on the detection of CD80 and CD69 on the cell surface of CD4+ T cells. To determine whether (20 μg/ml) CHX inhibited the de novo synthesis of protein, cells were analyzed for the detection of CD69 and CD80 upon activation of human CD4+ T cells. Three-color FACS analysis was used. A, CD69 detection in untreated CD4+ T cells (light gray line), or CHX-treated (20 μg/ml) cells (dark gray line), activated with 1 μg/ml anti-CD3 for 4 h. B, CD80 detection on untreated CD4+ T cells (light gray line) or CHX-treated cells (dark gray line) activated with 1 μg/ml anti-CD3 for 4 h. C, CD69 detection on untreated T cells (light gray line) and CHX-treated cells (dark gray line) after activation with C1R-A2 (as APC) and 1 μg/ml anti-CD3 for 4 h. D, CD80 detection on untreated cells (light gray line) and CHX-treated CD4+ T cells (dark gray line) after activation with C1R-A2 (as APC) and 1 μg/ml anti-CD3 for 4 h. Gates are based on isotype control (black histogram). When human T cells were exposed to CIR-A2 as APCs and anti-CD3 as signal 1, again a high level of CD69 was detected by three-color FACS analysis (all CD69/CD4+ cells were <1% positive for CD19). 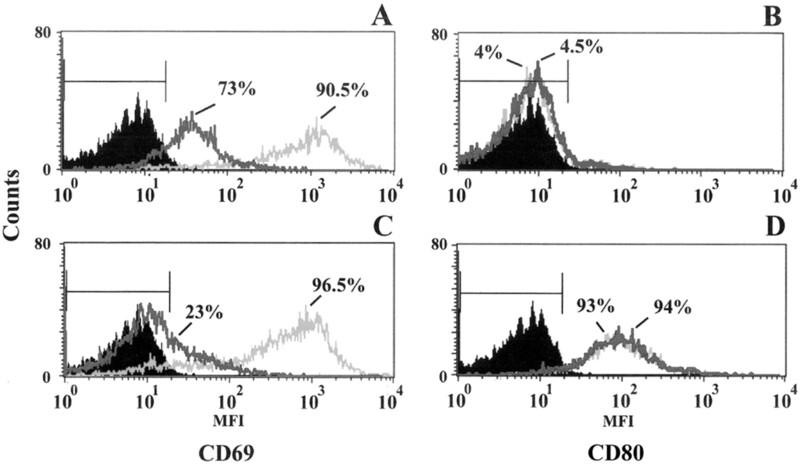 When an identical aliquot of human T cells was incubated with CHX and then exposed to APCs and anti-CD3, the level of CD69 detection (mean fluorescence intensity (MFI)) was reduced significantly and the percent of cells positive for CD69 was greatly reduced (Fig. 3⇑C). In contrast, when the CD4+ T cells (Fig. 3⇑C) were analyzed for levels of CD80, prior incubation with CHX was shown to have no effect on either the MFI or the percent of cells positive for CD80 (Fig. 3⇑D). These studies thus provide evidence that the CD80 detected on T cells at times of early activation is not attributable to de novo protein synthesis of CD80 by T cells, but rather its acquisition from APCs. To demonstrate further that the CD80 detected on CD4+ T cells after 24 h of activation with APCs and signal 1 results from acquisition and not endogenous up-regulation of CD80 mRNA, a RT-PCR study was performed. Purified CD4+ T cells were incubated with or without APCs (C1R-A2) in the presence or absence of anti-CD3 for 6 and 24 h. CD4+ T cells were separated from APCs, and their purity as well as CD80 expression were detected by three-color FACS analysis. The cells were >98% pure (CD4+/CD19−). The B cell line C1R-A2 was used as a positive control for the expression of CD80 mRNA. As shown in Fig. 4⇓A, lane E, purified CD4+ T cells expressed no mRNA for CD80. Upon activation of CD4+ T cells with anti-CD3 for 24 h, there was no up-regulation in the expression of CD80 mRNA (Fig. 4⇓A, lane F). Moreover, there was no expression of CD80 mRNA in purified T cells that were activated for 24 h with CIR-A2 either in the absence of anti-CD3 (Fig. 4⇓A, lane G) or in the presence of anti-CD3 (Fig. 4⇓A, lane H). In contrast, the mRNA from C1R-A2 gave a positive amplification signal labeled “positive control” (Fig. 4⇓A). β-actin expression demonstrated that equal amounts of RNA were used in each PCR. Similar studies were also conducted to analyze CD80 mRNA expression at 6 h of activation with APCs and anti-CD3. As shown in Fig. 4⇓A, lanes A–D, no expression of CD80 mRNA was detected. To establish the sensitivity of PCR for CD80 detection, a template dilution experiment was performed on a C1R-A2 cell line. cDNA of C1R-A2 was serially diluted (1/5- to 1/1200-fold dilution) and used for CD80 amplification in RT-PCR. The CD80 message could be detected in C1R-A2 (C1R-A2 cDNA at a 0.5-ng level of RNA) diluted 800-fold. These experiments demonstrated that there was no up-regulation of CD80 mRNA in CD4+ T cells activated with APCs and anti-CD3 for 6 or 24 h, and that expression of CD80 on CD4+ T cells is attributable to the acquisition, and not the up-regulation, of endogenous CD80 mRNA. Analysis of CD80 RNA expression from human CD4+ T cells by RT-PCR. A 1-kb fragment of CD80 cDNA was amplified by RT-PCR and used as a probe, as described in Materials and Methods. A, lanes A and E: purified CD4+ T cells (unstimulated) at 6 and 24 h, respectively; lanes B and F: purified CD4+ T cells stimulated with 1 μg/ml anti-CD3 for 6 and 24 h, respectively; lanes C and G: CD4+ T cells were cocultured with APCs (C1R-A2) for 6 or 24 h, respectively, and then purified as described in Materials and Methods; lanes D and H: CD4+ T cells were cocultured with C1R-A2 and 1 μg/ml anti-CD3, respectively, and then purified as described in Materials and Methods. Positive control is the cDNA from C1R-A2 cells. Negative control contained the CD80 probe without the addition of cellular cDNA. M is DNA-molecular size standard. B, To establish the sensitivity of detection of CD80, a template dilution experiment was performed on cDNA from CIR-A2 cells and CD80 expression was detected by RT-PCR. To investigate whether the interaction of CD80 on APCs with its receptors on T cells is required for CD80 acquisition, a number of studies were conducted to block CD80 on APC surfaces or CD28 on T cell surfaces. Thus, to block CD80 on the surface of APCs, C1R-A2 cells were treated with various concentrations of hCTLA-4 Ig fusion protein or Ig control protein (as described in Materials and Methods). These pretreated C1R-A2 cells were then cocultured with purified CD4+ T cells and anti-CD3 for 24 h. Using three color-FACS analysis, T cells were then analyzed for acquisition of CD80. As seen in Fig. 5⇓A, ∼70% of T cells incubated with C1R-A2 cells treated with Ig control acquired CD80 from C1R-A2. In contrast, CD80 acquisition was significantly reduced by purified CD4+ T cells that were cocultured for 24 h with anti-CD3 and C1R-A2 cells pretreated with hCTLA-4 Ig fusion protein (30–40 μg/ml). Upon pretreatment of APCs with high concentrations of hCTLA-4 fusion protein, the CD80 acquisition by T cells became almost undetectable (Fig. 5⇓A). Acquisition of CD80 is mediated through CD28 on T cells. A, C1R-A2 cells were treated with various concentrations of soluble anti-CTLA-4 fusion protein (to block the CD80 on C1R-A2) (▪), or control Ig (•), as described in Materials and Methods, and then cocultured with purified CD4+ T cells in the presence of 1 μg/ml anti-CD3 for 24 h. CD80 acquisition by these T cells was analyzed using two-color FACS analysis. Data are expressed as percent of CD4+/CD80+ T cells. B, Blocking of CD28 on CD4+ T cells using soluble CD80 fusion protein. CD4+ T cells were treated with various concentrations of soluble CD80 fusion protein (▪), or control Ig (•), as described in Materials and Methods, and then cocultured with C1R-A2 cells as APCs in the presence of 1 μg/ml anti-CD3 for 24 h. CD80 acquisition by these T cells was analyzed using three-color FACS analysis. Data are expressed as the percent of CD4+/CD80+ T cells. All CD4+/CD80+ T cells of A and B were shown to be negative for CD19. To further address this question, we blocked the CD28 molecules on the surface of CD4+ T cells using a soluble human CD80 Ig fusion protein (as described in Materials and Methods). Purified CD4+ T cells before treatment with soluble human CD80 Ig fusion protein expressed CD28 on their surface; however, there was no CTLA-4 expression. Therefore, the pretreatment of T cells with CD80 fusion proteins (30 min on ice) possibly led to blocking of the CD28 receptor. As demonstrated in Fig. 5⇑B, incubation of CD4+ T cells (pretreated with control Ig protein) with C1R-A2 cells in the presence of anti-CD3 for 24 h again resulted in the acquisition of CD80 by ∼70% of T cells. However, when CD4+ T cells were pretreated with a high concentration of CD80 fusion protein and then cocultured with C1R-A2 cells in the presence of anti-CD3, CD80 acquisition by T cells was significantly inhibited. This inhibition was directly related to the concentration of CD80 fusion protein that was used to pretreat the T cells (Fig. 5⇑B). These experiments not only demonstrate that CD80 is acquired across the membrane from APCs by T cells, but also suggest that this acquisition appears to be possibly mediated through the CD28 receptor. Further studies were then conducted to determine whether the transfer of CD80 to T cells is indeed mediated through its receptors. As summarized in Table I⇓, only 1–2% of purified CD4+ T cells expressed CD80 on their surface; activation of these cells with anti-CD3 for 24 h did not affect the CD80 expression. However, upon incubation of the CD4+ T cells with C1R-A2 cells in the presence of anti-CD3 for 24 h, >70% of these T cells acquired CD80 from APCs. Incubation of CD4+ T cells with pretreated CIR-A2 cells with control Ig protein in the presence of anti-CD3 also resulted in >70% of T cells acquiring CD80. However, when C1R-A2 cells were pretreated with hCD28 or hCTLA-4 fusion protein and then cocultured with CD4+ T cells in the presence of anti-CD3 for 24 h, only 0.3–2.6% of CD4+ cells acquired CD80. Furthermore, when purified CD4+ T cells were pretreated with 30 μg/ml CD80 fusion protein (to saturate the CD28 receptors) and cocultured with C1R-A2 cells in the presence of signal 1 (anti-CD3, 1 μg/ml) for 24 h, the acquisition of CD80 by CD4+ T cells was reduced from ∼70 to 12% of the cells (Table I⇓). To further investigate the role of CTLA-4 on CD4+ T cells in the acquisition of CD80, we examined CTLA-4 expression on the surface of the T cells before and after their activation with APCs (24-h postactivation). CTLA-4 expression remained extremely low over the 24-h time period (2–3%, data not shown). However, it should be mentioned that the failure to detect the CTLA-4 on the surface of T cells does not exclude its role in CD80 acquisition. These results (Fig. 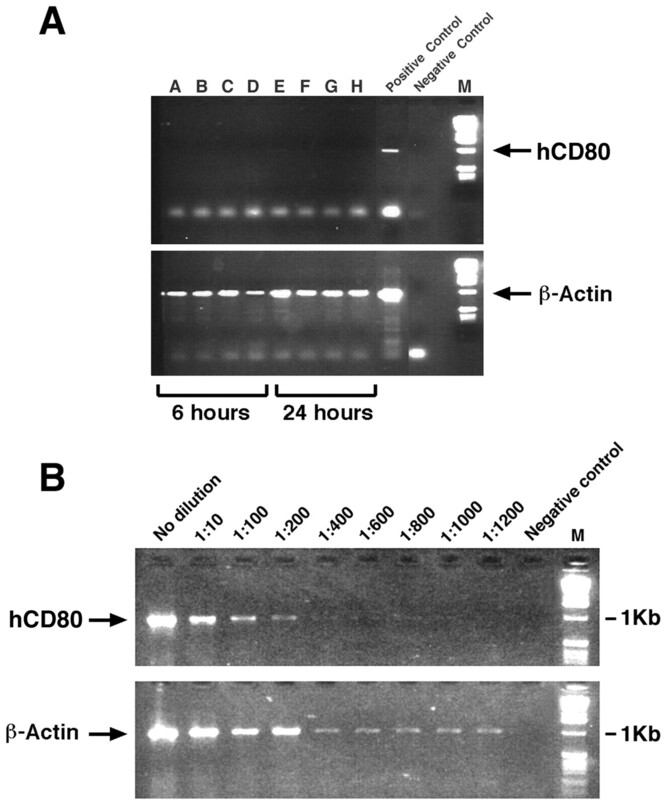 5⇑ and Table I⇓) collectively demonstrate that saturation of CD80 molecules on APCs by hCD28 or hCTLA-4 fusion proteins or blocking of CD28 molecules on T cells by CD80 fusion protein inhibits the CD80/CD28 interaction and results in a significant reduction in the acquisition of CD80 by CD4+ T cells. Moreover, these experiments further demonstrate that CD80 acquisition is not a passive and/or random process and is not due to de novo expression of CD80. To investigate the potential biological role of CD80 acquisition by CD4+ T cells, freshly purified CD4+ T cells from healthy donors (which express very low levels or almost no CD80) were incubated with 1 μg/ml anti-CD3 and CIR-A2 cells to acquire CD80. After 24 h, CD4+ T cells were separated from APCs (by column purification) and analyzed by three-color FACS analysis for CD4+, CD80, and CD19. As shown in Fig. 6⇓A, the purified CD4+ T cells were CD19−, which demonstrates their lack of APC contamination. Moreover, >70% of the CD4+ T cells had acquired CD80 and expressed MHC class II molecules (Fig. 6⇓, B and C). To establish the role of CD80 acquisition in T cell interactions, CD4+ T cells that had acquired CD80, and were purified as demonstrated in Fig. 6⇓, were used in proliferation assays. As demonstrated in Fig. 6⇓D, lane A, purified CD4+ T cells (that had not acquired CD80) showed very little proliferation after 48 h. In comparison, when purified CD4+ T cells that had acquired CD80 (as shown in Fig. 6⇓B) were cultured for 48 h in the absence of anti-CD3, there was a significant proliferative response (Fig. 6⇓D, lane B). This proliferation may be due to the acquisition or up-regulation of peptide MHC complexes (as depicted in Fig. 6⇓C and Ref. 11) when CD80 acquisition occurs; it may also be due to cross-presentation to neighboring cells. The addition of anti-CD3 to the culture caused a slight enhancement in their proliferative response (Fig. 6⇓D, lane C). When CD4+ T cells that had acquired CD80 were cultured in a medium containing 10% dextran (used to separate the cells and reduce their cell-cell interaction without affecting their characteristics), in the absence of anti-CD3, proliferative responses of CD4+/CD80+ T cells were significantly reduced (Fig. 6⇓D, lane D). Similarly, proliferative responses of purified CD4+/CD80+ that were cocultured with anti-CD3 in medium containing 10% dextran were reduced significantly (Fig. 6⇓D, lane E). By adding dextran, a physical space between neighboring (bystander) cells is created, thereby reducing the T cell to T cell interaction; this leads to a decrease in proliferative response in CD80-acquired CD4+ T cells. Biological effect of CD80 acquisition on T cell stimulation. Purified human CD4+ T cells were cocultured with C1R-A2 cells in the presence of 1 μg/ml anti-CD3 for 24 h. Upon acquisition of CD80 from C1R-A2, T cells were separated from C1R-A2 cells and were analyzed by three-color FACS analysis. A, Two-color FACS analysis of purified CD4+ cells for the expression of CD4+ and CD19 showing the purity of separated CD4+ T cells. B, CD80 acquisition of purified CD4+ cells from C1R-A2. C, MHC class II expression (HLA-DR) of purified CD4+ cells from C1R-A2. D, Effect of dextran on the proliferative response of human CD4+ T cells vs CD4+ T cells that have acquired CD80. Lane A, Purified CD4+ T cells. Lane B, Purified CD4+ T cells that had acquired CD80 from C1R-A2 cells. Lane C, Purified CD4+ T cells that had acquired CD80 from C1R-A2 cells cultured with 1 μg/ml anti-CD3 Ab for 48 h. Lane D, Purified CD4+ T cells that had acquired CD80 were cultured with 10% dextran for 48 h. Lane E, Purified CD4+ T cells that had acquired CD80 were cultured with 10% dextran in the presence of 1 μg/ml anti-CD3 for 48 h. Proliferative responses of these cells were measured by [3H]thymidine uptake at 48 h.
These results demonstrated that CD4+ T cells, upon acquisition of CD80, are able to positively signal to themselves and other neighboring T cells in the presence or absence of signal 1. In this study, we have demonstrated for the first time that purified CD4+ T cells from normal healthy donors could acquire CD80 from human APCs (DCs or B cell lines). Our data demonstrated that the acquisition of CD80 is enhanced by TCR engagement and is dependent on the expression of CD80 on the APCs. Moreover, the expression of CD80 molecules on the surface of CD4+ T cells at an early stage of T cell activation (4–24 h) is attributable solely to its acquisition rather than the up-regulation of CD80 mRNA or de novo CD80 protein synthesis. Furthermore, blocking studies with soluble fusion proteins (sCD28, sCTLA-4, and sCD80) indicated that CD80 acquisition was mediated through its interaction with its receptor, possibly CD28; however, CTLA-4 might be a player in this phenomenon. Because there is no anti-CD28-blocking Ab, fusion proteins were used in the studies reported here. However, it should be mentioned that using fusion proteins to block the CD80 on APCs might lead to steric hindrance that interferes with cell:cell conjugate formation; this might also contribute to the inhibition of CD80 acquisition by T cells. However, it should be pointed out that previously reported (12) murine studies demonstrated that CD28 is responsible for CD80 acquisition. In addition, the results of proliferation assays demonstrated that CD4+ T cells, upon acquisition of CD80, can further stimulate themselves and neighboring T cells to proliferate. In our previous studies, we had demonstrated that high affinity TCR-transgenic murine T cells were able to acquire CD80 (12). In this study, for the first time, we demonstrated that naive human CD4+ cells from normal donors can do the same. Moreover, we demonstrated that CD80 acquisition takes place in early activation stages of human T cells; however, long-term activation of T cells can lead to endogenous up-regulation of CD80. Using dextran studies, for the first time, we demonstrated that there is cross-presentation to other T cells. The CD4+/CD80+ cells that were treated with dextran also demonstrated a low level of proliferation, thereby suggesting that T cells may also continue to signal to activate themselves. In the past few years, the mechanisms by which T cells migrate from the blood to secondary lymphoid organs, interact with APCs, and either become tolerant or acquire effector and/or memory function are now beginning to be understood. In this dynamic world of cognate cell-cell interaction, it is likely that, at several different stages, CD80 family members play crucial roles. The interaction of the CD80 molecules with CD28 generates costimulatory signals amplifying TCR signaling and preventing anergy, whereas interaction with CTLA-4 induces powerful inhibitory signals in T cells (20, 21, 22, 23, 24). Previously, it was reported that T cell-APC contact is followed by a down-regulation of TCR (25, 26) and that T cell-APC interaction can cause APC-derived surface molecules to adhere to the surface of T cells (27, 28). Recently, our laboratory as well as others have demonstrated the acquisition of CD80 molecules by naive and memory murine CD4+ T cells via direct transfer of these molecules at the site of interaction through CD28 receptors (10, 12). We further demonstrated that upon acquisition of CD80, CD4+ T cells from mice could act as an APC to stimulate other T cells, thus amplifying an immune response. This mechanism of T cell to T cell costimulation could facilitate the regulation of the immune response in murine models. The question then arises whether human T cells behave in a manner similar to that of their mice counterparts and, if so, what are the immunoregulatory consequences of acquiring costimulatory molecules in the human immune system? Indeed, all previous reports (17, 18, 19, 29, 30, 31, 32, 33) describing the presence of CD80 on human T cells reported the “expression” of CD80 on T cells, and none have described its acquisition from APCs. The results of this study clearly demonstrated that human T cells are capable of acquiring CD80 from APCs in the early stages of T cell activation. A previous study by Azuma et al. (17) demonstrated that T cell clones coexpress both CD28 and CD80 simultaneously. Similarly, studies by Wyss-Coray et al. (34) demonstrated that cloned T cells activated with APCs and rested for various times express CD80 at 7–9 days postactivation. However, it should be pointed out that these T cells were stimulated in the presence of APCs for long period of times. Therefore, it is conceivable that CD80 expression on these cells was indeed due to the up-regulation of endogenous CD80, but it also could have been at least partially attributable to the acquisition of CD80 from APCs. To determine whether the freshly isolated CD4+ T cells (in the absence of APCs) were able to up-regulate CD80 expression, we stimulated purified CD4+ T cells with anti-CD3, or with a combination of anti-CD3 and anti-CD28, for 24 and 72 h. The FACS analysis showed no significant change in the level of CD80 expression on CD4+ T cells (<5%) at 24 h. Indeed, after 3 days of very potent stimulation, 30% of CD4+ T cells expressed CD80. These results taken together demonstrated that with a longer stimulation time, CD4+ T cells can indeed up-regulate CD80 to some degree; however, the level of expression was never as high as it was observed in the early stages of T cell activation in the presence of APCs and signal 1 (TCR engagement). Therefore, endogenous CD80 up-regulation on CD4+ T cells seems to be a late event during T cell activation. It should be pointed out that in our experiments we have used primary CD4+ T cells (as opposed to T cell clones) and examined early activation events (within the first 24 h) compared with longer time periods in previous studies (17, 18, 19). Therefore, our results in conjunction with these previous studies indicate two different mechanisms for the acquisition/expression of CD80 on the surface of T cells. One mechanism, the acquisition of CD80 molecules, may play a role during the early stages of activation of T cells and APCs; the second mechanism, endogenous up-regulation of CD80, may play a role at the late stages of activation (days after the activation of T cells) and involve up-regulation of endogenous CD80 in T cells. In this study, the results of proliferation assays (using dextran to create physical spaces between T cells and separate them from neighboring cells) for the first time demonstrated that human T cells, upon acquisition of CD80, can positively signal to themselves, thereby directly inducing T cell proliferation. The data presented in Figs. 2⇑ and 6⇑ also rule out the possibility of contamination of purified T cells by APCs. In addition, the study showed that CD4+/CD80+ T cells, upon acquisition of CD80, also expressed MHC class II and could positively signal the neighboring T cells, causing a significant increase in the proliferative activity of these cells. Moreover, it is important to point out that data from proliferation assays clearly demonstrate that CD80 molecules upon acquisition are still functional and acquisition of these costimulatory molecules is not a static event. Previous studies had suggested that T cells express CD80 and can function as APCs. In our studies, for the first time, we demonstrate that expression of CD80 in the human T cells—at least at early activation stages—is due to the acquisition of CD80; this acquisition is what leads to T cells functioning as APCs. These data might suggest that CD80 acquisition by T cells may play a role not only in self-sustained signal pathways, but perhaps in sending a positive signal to adjacent T cells. Recent studies have demonstrated a similar concept in HIV infection (35). It has been shown that the newly formed HIV virions contain cellular host constituents. Indeed, cell membrane proteins, such as MHC class II, ICAM-1, and LFA-1, were found to be acquired by the retrovirus (35). Also, it was demonstrated that several of these virion-acquired proteins have functional effects on the biology of HIV-1 and play a key role in the attachment process of HIV-1 to its target. Furthermore, Bounou et al. (36) demonstrated that host-derived costimulatory molecules, such as CD80 in virions, are not only functional but are important in HIV-1 signal transduction pathways. It has been speculated that CD80 expression on human T cells in PBMC of HIV patients, or on T cells from synovial fluid of rheumatoid patients or peritoneal fluid of cancer patients, is attributable to the up-regulation of CD80 (18, 19, 32, 37). In this study, for the first time, we demonstrated that acquisition of CD80 from APCs is indeed the mechanism for CD80 detection on T cells at the early stages of T cell activation. The question then arises: what is the physiological relevance of T cells acquiring costimulatory molecules in various pathological diseases? One may speculate that the T cells that had acquired CD80 may bring about unrestricted activation of bystander T cells, leading to a highly activated immune system. In HIV studies, this phenomenon may lead to HIV replication, which requires activated T cells, and the progression of the disease. In contrast, in cancer studies, the acquisition of CD80 by human T cells and their ability to activate bystander T cells may allow the potentiation of immune responses to tumor Ags. Therefore, depending on the immunological setting, CD80 acquisition may lead to different outcomes. In conclusion, the studies reported here demonstrated for the first time that CD4+ T cells can acquire CD80 upon activation with autologous or allogeneic APCs. Furthermore, we demonstrated that CD80 acquisition by CD4+ T cells is mediated through CD28 receptors and plays an important role in the activation of the cells that have acquired these molecules, as well as adjacent T cells. The acquisition of CD80 by T cells might play a role in the regulation of immune responses to pathogens and/or in diseases of the immune system. Our laboratory is currently investigating the mechanism that may play a role in this phenomenon. We thank Debra Weingarten for her editorial assistance in the preparation of this manuscript. ↵2 Abbreviations used in this paper: DC, dendritic cell; CHX, cyclohexamide; MFI, mean fluorescence intensity; rh, recombinant human.